With more than 4 billion users now connected to the internet, 50% of the global population (Forbes, December 2018), it is not surprising that the education sector has embraced devices and software to interact, engage, and enhance the learning environment for students. The SaaS subscription revenue model that works for many online education products, coupled with the large market sizes these technologies can serve, has driven interest from venture capitalists and private equity firms for decades. 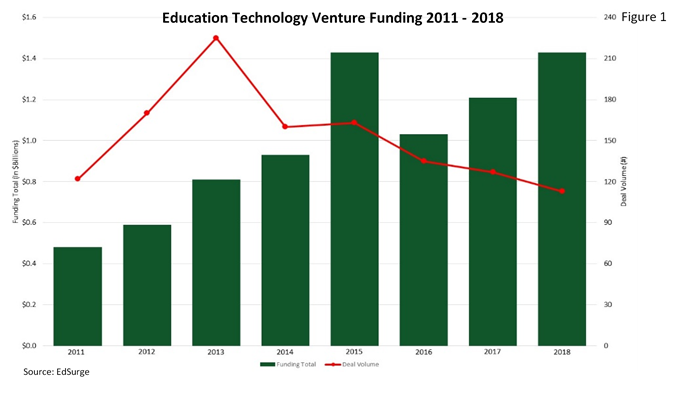 The key difference in the past few years, however, has been larger funding rounds and valuations across a fewer number of EdTech companies. For the fortunate few, this means a more fully-funded growth plan to seize market opportunities, and the ability to wait out what can sometimes be a painfully long customer adoption cycle. For those EdTech companies that cannot access funds, or simply do not wish to raise large sums of venture capital money, their ability to maintain a first-mover advantage, or reach cash-flow positive without capital constraint, could be jeopardized by the presence of well-funded rivals. In the EdTech market alone, the total amount raised in 2018 was $1.45B, matching the previous annual record set in 2015, (Figure 1), but the total deal volume has dramatically decreased 32% from 165 deals to 112 deals. One factor causing larger deal sizes, but less of them, is that many of the large later-stage deals in the EdTech space would have otherwise likely been IPO candidates in years past. However, companies today choose to take their time with an IPO due to the plentiful capital supply in the private markets as well as the regulatory headache and market scrutiny associated with being a public company. This distorts the total private placement numbers we see since the well-funded companies completing the larger private placements pre-IPO comprise a large portion of the overall deal volume. These deals would have been public market statistics in the past. EdTech unicorns, companies that have reached billion-dollar valuations prior to an IPO, are prominent in the United States and also China. Of the top 10 funded EdTech companies to reach this valuation, 6 originate from China with companies such as VIPKid, iTutorGroup, and Youdao building strong traction as online education and personalized tutoring platforms. Zuoyebang, a web and mobile platform to assist K-12 students on homework assignments, received $500M investments over 2 rounds of funding in August 2017 and July 2018; an additional $500M of developmental capital from Softbank is said to be upcoming. In the United States, Udemy and Udacity have both reached $1.0B valuations, led by ICONIQ Capital and Bertelsmann Digital Media, respectively. Age of Learning also reached unicorn status through providing a strong curriculum for K-12 students. In addition to the unicorn funding rounds, the smaller size companies are getting bigger checks as well. Earlier bets with larger equity checks from a smaller group of VCs can steer specific start-ups towards success while crowding out others. Some notable larger-sized equity rounds in 2018 include Omidyar’s $40M Series C investment in October 2018 into Handshake, a career platform to connect students and recruiters, JMI Equity’s $55M investment in April 2018 into CampusLogic, a student financial service platform, and New Enterprise Associate’s $85M investment in September 2018 into MasterClass, an online education platform to offer video-based vocational courses to complete degrees and certificates. EdTech is not unique in this trend of bigger, but less frequent, deals. In 2018, total venture capital funding notched a new record at $99.5B compared to $76.4B in 2017 (PWC Money Tree Report, January 2019). The average size for each venture funding stage was $37.5M in Q4’18 for later stage deals and $8.0M for early stage deals, an increase of 50% and 14% from 2017, respectively. Total number of deals, however, fell to just over 5,500 private placements, demonstrating the lowest level of deal activity since 2013. This alludes to a bigger picture—investors are pouring funding in specific companies and cutting bigger checks across a limited amount of companies. We believe the trends witnessed in 2018 will continue in the near future for EdTech and the private placement market as a whole. Valuations in private markets may gyrate alongside public markets at times, though liquidity and transparency of secondary trades in the private markets may obscure the effect public markets or other economic indicators have on specific pricing of private placement financing rounds. The broader effects of this trend on education remain to be seen, but we can likely expect a smaller sample of innovative products, but perhaps more standardization across the industry vertical. Jon Thomas, Managing Director, leads the private placements and financial sponsors coverage at Woodside Capital Partners, a value-added investment bank focused on middle market and emerging growth companies in the technology sector. This article is an overview and analysis of industry trends and is not intended to provide investment recommendations on any specific industry or company. All information supplied or obtained from this report is for informational purposes only and should not be considered investment advice or guidance, an offer of or a solicitation of an offer to buy or sell a security, or a recommendation or an endorsement by Woodside Capital Partners International, LLC, or its affiliate, Woodside Capital Securities, LLC, of any security.